Small hive beetle (SHB) (Aethina tumida) is a small brown-black beetle with clubbed antennae that originated from sub-Saharan Africa. In Africa, the SHB is not a significant honey bee pest species; however, since arriving in Australia in 2002, the SHB has caused a major impact to honey bee colonies throughout the warm and humid coastal strip between Victoria and North Queensland. The larval stage of the SHB life cycle causes the majority of damage to active hives by burrowing into combs, eating brood, honey and pollen. Unlike some other honey bee pest species, SHB is preferentially attracted to active hives because of the availability of food. Whilst feeding the larvae also carry a yeast species (Kodamaea ohmeri) which contaminates the honey causing it to ferment. Heavy infestations cause the hive to become ‘slimed out’ and may cause the colony to die or abscond. The development of SHB throughout its lifecycle depends primarily on humidity, temperature and food availability. As such SHB has the greatest impact in the warm and humid coastal strip between Victoria and north Queensland, but its presence has also been detected in all states and territories of Australia, except Tasmania, Northern Territory and southern parts of Western Australia. The SHB lifecycle can take between 3–12 weeks and has four stages: egg, larva, pupa, and adult beetle. Female SHBs can lay approximately 1000 eggs in their lifetime, with some research suggesting an upper limit of 2000 eggs. The female will lay the clusters of approximately 10–30 eggs within capped brood cells or in the small cracks and crevices around the hive. The eggs are pearly white, and approximately 1.4mm long and 0.26mm wide, about 2/3 the size of a honey bee egg. The number of eggs that will hatch depends primarily on the relative humidity, with some evidence suggesting at 30oC, no eggs will hatch at or below 34 per cent relative humidity. It takes approximately 1–6 days for larvae to emerge from the eggs, though most hatch within 3 days within a hive. The larval stage of the SHB lifecycle is the most damaging because the larvae immediately start to burrow through combs and cappings, and consume honey bee eggs, pollen and honey. They also defecate throughout the comb, releasing the yeast K. ohmeri, which contaminates the honey in both active hives and stored combs. This yeast causes the honey to ferment, which may cause the hive to become ‘slimed out’ and die or abscond. The larvae are approximately 1cm long and 1.6mm wide and are a creamy white with a tan-brown head. They have three pairs of prolegs at the front of their body and two rows of small spikes down the length of their back. The developmental period for the larvae depends on the temperature and the availability of food but generally takes between 8–29 days. After a feeding period of between 6–14 days larvae enter a ‘wandering’ phase where they could travel up to 200m outside the honey bee colony to find an appropriate site for pupation, typically moist soil. At this point the SHB may be vulnerable to predation by ants or birds. When larvae cannot find an appropriate site for pupation they are able to pause development for a period of time until suitable conditions arise. Once the larvae find a suitable site, they will burrow approximately 5–20cm into the soil and construct a smooth-walled pupation chamber. Moist soil and warm temperatures are critical for successful pupation and the emergence of the adult beetle. Pupation can take between 2–12 weeks depending on these environmental factors. During cold periods of less than 10oC pupation can take up to 100 days. Pupae are initially creamy-white and then change to chestnut brown or black as they develop into an adult beetle. Once the adult beetles emerge from the soil they fly in search of new honey bee colonies to infest. Adult SHBs are able to fly up to 15km to locate a honey bee colony to infest. Adult beetles prefer weak hives in spring and summer, but strong hives in autumn where the higher honey bee numbers keep them warm. It is believed that the SHB adults find the hives by detecting the odour of adult bees and hive products (honey and pollen). There are some suggestions that the adult beetles can also detect the honey bee alarm pheromone. Adult beetles are 5–7mm long and 3–4.5mm wide and females tend to be longer and heavier than males on average and occur in greater proportions in the population. 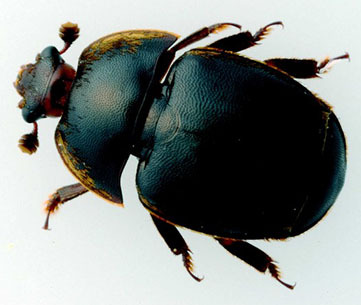 The adult beetles have clubbed antennae and are initially a yellowish or reddish brown transitioning to brown or black as their exoskeleton hardens. Adult beetles reach sexual maturity at 7 days and mate within the honey bee colony. 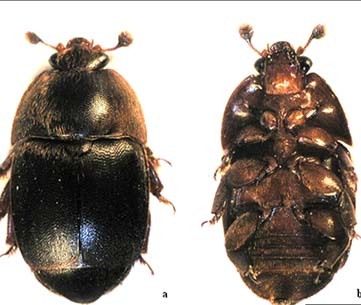 Adult beetles can survive up to 6 months feeding on honey and up to 50 days feeding on an old empty brood comb. Adult beetles can also be fed by bees in the hive via mouth-to-mouth feeding, especially when they are confined to bee-guarded ‘prisons’. 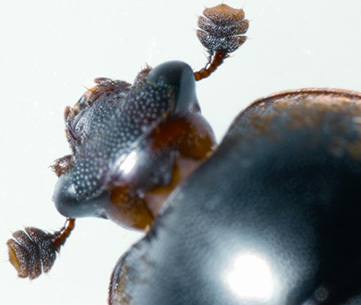 The beetles use their antennae to induce guard bees to regurgitate food, which the SHB then consumes. Adult SHB vary slightly in colour depending on age, ranging from yellowish or reddish brown to a darker brown or black and have distinctive club-like antennae. Adults are 5–7mm long and 3–4.5mm wide and females tend to be longer and heavier than males on average. The adult beetles avoid sunlight and can be observed running for cover into corners, over the comb or flying away when a hive is inspected. The adult beetle may also be present in comb cells or in the debris at the bottom of the colony. The eggs of the SHB are tiny (about 1.4mm long and 0.26mm wide) and are pearly white. 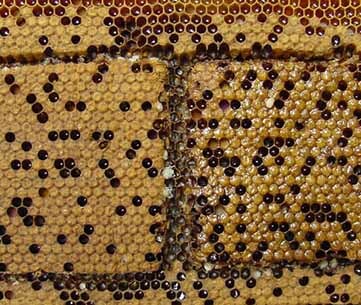 In strong honey bee colonies the eggs can be found in clutches in small cracks and crevices of the hive frame, while in weaker colonies the eggs can be found directly on brood comb. Larvae are white with a brown/tan head, are approximately 10 mm long with three pairs of prolegs near the head. 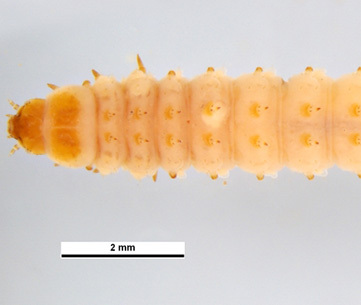 The larvae also have two rows of small spikes down their back. Once they mature, larvae leave the hive and burrow into the ground surrounding the hive to pupate. It may be possible to find larvae and pupae by sifting through the soil surrounding the honey bee colony. The honey comb itself may be an indicator of the presence of the SHB, as honey comb will appear wet and greasy due to the ‘sliming out’ (fermentation) of the honey. The comb or hive may also have a rotten smell, similar to decomposing oranges, due to the death of honey bee brood and the fermentation of the stored honey. When there are higher numbers of SHB infestation they can be easily recognised in the hive either indirectly through the associated damage/symptoms, or directly through the presence of eggs, larvae or adults. Indirect recognition may be done by observing the fermented honey caused by SHB larvae contaminating the honey with yeast (K. ohmeri), which makes the honey look greasy and slimy and causes it to weep out of the comb cells. The fermentation often results in the hive having a smell like rotting oranges. Detection can be extremely difficult when SHB are in low numbers. Adults can exit infested hives during the day and return at dusk to infest different hives, particularly those that have recently been opened. Due to the SHB attraction to recently opened hives and evidence suggesting that the SHB take advantage of colony disruption to lay in undefended brood cells, it is recommended when inspecting an apiary for SHB to start with the weakest or queen-less hives. It is necessary to inspect all honey and brood combs for beetles and larvae because they can be present on any comb throughout the hive. One effective method of inspecting a hive for SHB involves removing and placing the lid of the hive on the ground, before placing a super squarely on top of the lid. Any SHB present on the super will move down onto the lid to avoid the light. After a few minutes the super can be removed in order to inspect the lid for SHB. Beekeepers should look for the adult SHB in the darker parts of the hive. Adult SHB avoid light and will seek refuge quickly when the hive is inspected. Inspect underneath the hive lid, as well as the brood box, and in the debris found on the bottom board. 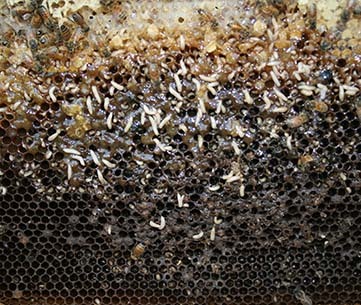 Weak and stressed colonies with a low bee-to-comb ratio are considered the most susceptible. Pupae may also be found by sifting the soil around the bee colony. It is important to note that SHB is not present in Tasmania, Northern Territory and in southern Western Australia. SHB is a reportable pest in these jurisdictions. If you detect SHB you should contact your local department of agriculture immediately. SHB can spread very quickly through a range of methods. SHB’s are strong flyers and can travel up to 15km to find a new hive and colony. SHB are attracted to new hives and colonies by the odour the colony produces. Feral honey bee populations have also assisted the SHB to become established in areas with suitable climatic conditions. One of the main mechanisms for spread is through the movement of hives and hive products between infested areas and non-infested areas. This includes beekeeper assisted movement of colonies of honey bees, or through the transportation of infested hive products including honey comb, bee collected pollen, slum-gum, beeswax cappings and scraps which have not been melted down. SHB is also a pest of stored combs and supers, and can also be easily spread through the movement of stored combs and supers which are believed to be clean. SHB was first detected in Richmond, New South Wales, Australia in October 2002. It is now present throughout New South Wales, Queensland, Victoria, the Australian Capital Territory, and in some parts of South Australia. So far it has not been detected in the Northern Territory or Tasmania, and it has a very restricted distribution in northern Western Australia. SHB is more problematic in areas with warm temperatures and high humidity, particularly on the east coast of Australia from Victoria to northern Queensland. SHB is a reportable pest in these jurisdictions where it is currently not present, or where it only has a very restricted distribution. If you detect SHB you should contact your local department of agriculture immediately. SHB is also present throughout the United States of America, including Hawaii. SHB larvae look similar to Wax moth larvae and it is possible that both species can appear in the one hive. However, it is possible to distinguish between the larvae of each species through morphological and behavioural characteristics, as well as the respective hive symptoms. 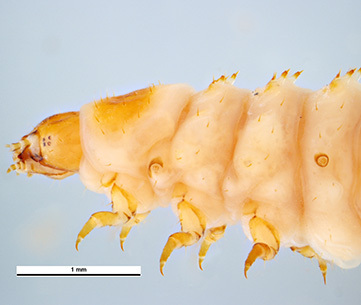 The larvae of both species have 3 pairs of legs near the head. However, wax moth larvae also have small, less developed legs in pairs along the rest of the body. Wax moth larvae also do not have the two rows of short spines which are present on the backs of SHB larvae. Wax moth larvae grow to be much larger than SHB larvae, around 25mm in length compared to 10mm respectively. 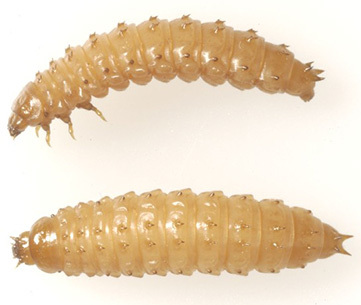 The faeces of the different pest species are also distinct; a SHB’s faeces is typically consistent with a long thin thread, while Wax moth larval faeces are individual dark cylindrical pellets. SHB larvae will typically exit the hive to pupate in the soil around a hive. However, wax moth larvae will pupate in whitish cocoons within the hive, typically on the hive frame. 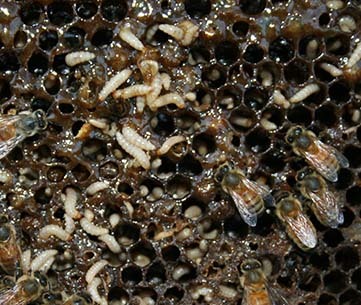 SHB larvae can be found throughout a hive regardless of the strength of the colony. However, wax moth larvae will usually only be on the outer margins of the brood nest in stronger hives. 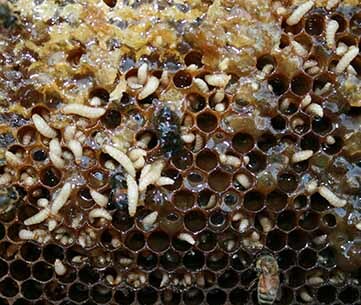 In dead or weak hives the larvae can be found throughout the hive. 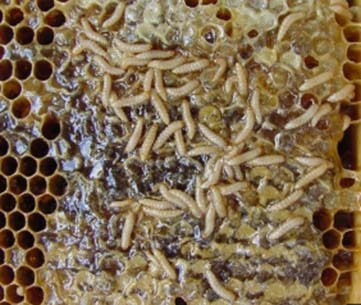 SHB larvae can also tunnel through the comb cells storing both fresh honey and brood comb. 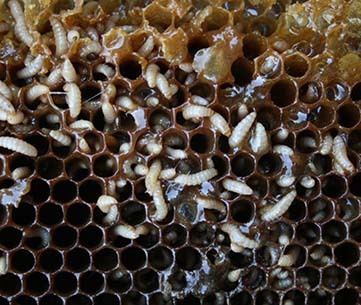 However, wax moth larvae typically do not tunnel through frames of fresh honey. The hive symptoms are the key way to distinguish a SHB infestation from a Wax moth infestation. 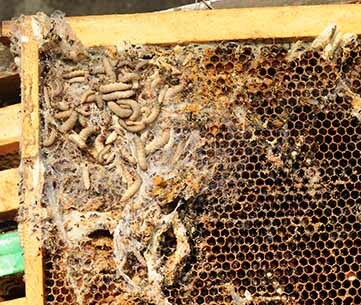 SHB larvae cause honey stored in comb to ferment and become ‘slimed out’. However, Wax moth larvae leave behind a characteristic mass of dry silken webbing throughout the comb and tough white cocoons on the frames. One of the most important things for beekeepers to note is that many states and territories in Australia have laws that require beekeepers and apiary officers to notify the relevant state or territory agricultural department within a certain amount of time if SHB is detected. Beekeepers should make themselves aware of the relevant state or territory’s reporting requirements. Long term control of SHB will only be successful if combinations of control techniques are used in active hives and in stored equipment/comb. Control techniques that involve exclusion, good colony management and apiary hygiene will have the biggest impact on SHB management at the lowest cost. While SHB will be subject to natural predation throughout its lifecycle (particularly as wandering larvae and during pupation), in isolation this has not proven to be an effective control mechanism in Australia. To protect hives against SHB it is critical to maintain strong, health colonies with a young productive queen bee and a high bee-to-comb ratio. This will require beekeepers to regularly replace the queen bee. Supers should only be added to a strong colony when 70 per cent of combs in the hive are filled with honey and/or brood and there are sufficient honey bees to protect and maintain the supers. When undertaking these management practices it is always necessary to ensure that SHB or other honey bee pests are not being transmitted. It is also good practice to avoid providing conditions that favour SHB reproduction and development. This includes minimising the cracks and crevices of the hive, and removing burr comb and propolis, which are all areas the SHB can hide in or lay eggs. Apiarists should avoid placing their hives in areas of known high SHB population, particularly during high risk times of the year. Hives should be placed in a sunny location, on areas of rubble or hard dry soil to minimise SHB pupation sites. Hives may need to be ventilated for short periods (a few hours) to reduce humidity in the hive, but beekeepers should be cautious of robbing that can occur. One aspect of good colony management is apiary hygiene. The bottom boards of hives should be kept free of debris that can provide a hiding place or breeding area for SHB. Beeswax scraps, old combs and dead colonies which can attract SHB and encourage breeding should be removed from in and around apiaries and treated promptly. Any equipment or comb that has been infested with any stage of the SHB life cycle or contaminated with fermented honey should be decontaminated or treated appropriately prior to being reused. There are commercial products and homemade devices to trap and reduce adult SHB populations in the honey bee colony. These methods rely on SHB’s tendency to seek protection from the harassment of the honey bees and light. As the odours of honey, pollen and adults bees attract SHB to apiaries and because opening and manipulating a hive can trigger SHB females to lay eggs, inspection of hives, while necessary for good hive management, should be kept to a minimum. This problem can be overcome by easily accessible traps, typically placed in the bottom of the hive, as frequent inspection may be as simple as sliding the trap out of the hive or removing the bottom board for access to the trap. One of the most effective treatments available to beekeepers around Australia is Apithor™. The Apithor™ harbourage is comprised of two black, rigid moulded plastic shells that hold a Fipronil treated 4 mm corrugated cardboard insert. This insert is located 10 mm back from the 3 mm wide entrance slots. Size differences between the beetles and the honey bees and the precise dimensions of the harbourage prevent the honey bees from contacting the cardboard insert but allow easy access for SHB. The plastic shells are ultra-sonically welded to produce a tamperproof device so that the harbourage can be safely handled without fear of contacting the insecticide. The SHB is a shy insect, so when it runs into the Apithor™ trap for protection, it touches the Fipronil coated cardboard, which ultimately kills the SHB. Some other commercial SHB traps include Beetltra™ and AJ’s Beetle Eater™. Beetltra™ is a semi-permanent attachment which is fitted underneath the beehive (not inside) using screws. It can be accessed without disturbing the hive. AJ Beetle Eater™ sits between the top bars of the frames of the hive, it is necessary to open the lid of the hive to install and remove the trap. Reservoirs at the bottom of the trap kill the SHB that seek refuge inside but honey bees are prevented from entering. Traps can also be placed in storage rooms and extracting facilities to minimise SHB numbers. SHB larvae are attracted to fluorescent and halogen lights. These can be mounted above large shallow containers of vegetable oil or detergent to kill the SHB that crawl into it. These traps can also be inspected regularly to check for the presence of SHB in stored equipment and extracting facilities. 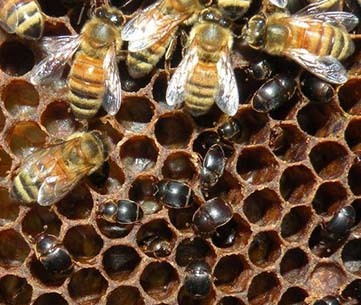 To avoid contamination of products by SHB, combs that contain even a small amount of bee brood should not be brought into an extracting facility. The extracting facilities are often warm and provide perfect environmental conditions for SHB reproduction and development. To avoid attracting SHB to the facility dead bees, wax, cappings and other debris should be cleared away and melted down promptly. Do not leave anything in the extracting facility that could provide a habitat for SHB. The chemical treatment of stored equipment, comb or honey products is not recommended as they contaminate the apiary equipment, honey products and can in turn contaminate honey bees. Instead of the risk associated with using chemicals on stored equipment or combs, there are simple hygienic practices which could be implemented to avoid SHB outbreaks. While combs may often appear free of SHB infestation, very small SHB eggs or larvae may be present on supers or apiary equipment. SHB eggs can hatch within 2–4 days, so honey combs should be extracted soon after removal from the hive to avoid delayed contamination of the honey products. If extraction is not possible within this time frame, supers should be protected from SHB infestation. Storing supers in cool rooms maintained at 10oC or less will prevent the adult SHB from laying eggs and will minimise SHB larval activity. Similar to Wax moth control techniques, research has indicated that storing equipment and comb in a freezer at or below -13oC for 6 hours (from the time the equipment reaches the required temperature) will kill all stages of the SHB life cycle. After cold treatment the equipment, supers and honey products should be stored in SHB proof environments to avoid reinfestation, such as in sealed containers or strong plastic bags. Storage rooms should be well ventilated and lit, and have a relative humidity at or below 34 per cent. These conditions can be achieved in closed rooms by using lights, dehumidifiers and oscillating fans. Alternatively, equipment or honey products could continue to be stored in cold rooms at the appropriate temperature. Any contaminated supers or honey products are not suitable for human consumption or use, and will repel honey bees. The contaminated product should be extracted separately and buried (minimum depth is 1m) or burnt. The extraction facilities must be sanitised prior to reuse to prevent spoiling other products. These videos provide information about the life cycle and biology, identification and possible management options for Small hive beetle. Please be aware that some of these videos were produced overseas, and treatment recommendations or conditions experienced may differ to those in Australia.